Usually a Take a Break day, but this poster coach is about a different kind of break meant mainly for couch potato parents who have hired help and for grandparents. Take a break from sitting and Move Your Body. Many of these can be done while sitting or lying in bed or on the couch. Move your body is one of my 12 Daily Emotional Fitness Exercises. Granted parents involved in daily physical care of a child under five, get almost all the exercise needed. Others who get all the exercise needed are those who have enough help to go to the gym. Then there are the celebrity parents with their personal trainers, nannies and cooks. As children age, those of us who are couch potatoes any way need some pushing to move our body. Move it or lose it applies to bodies. When I was young and unencumbered by several rolls of padding, I loved to run, skip, and jump. My body was light and I felt like I could fly. No longer. My added weight enhanced my weight bearing exercises but reduced good feelings. I am now about thirty or forty pounds lighter then when on Oprah. Not so bad my doctor urges dieting, but not where I would like to be. I did two things to let go of that weight. First I practiced healthier eating not dieting. Notice I said healthier, not healthy. Tried to eat only what I loved, truly savor what I was eating, use substitution that offered fewer calories. Then I tried to tailor exercising to fit me, my life, and my schedule. Walking and gentle aqua-aerobics are my favorite. I long to go horseback riding. Wish Colorado had a Therapeutic Riding Program for Old Folks. I am on blood thinners so riding on my own would be dangerous. Anyway, I digress. Back to caring for your body. A must for parents. Writing and promoting my eBooks (my newest children) means long hours at the computer. That is what has had me doing some easy move your body exercises. That and beginning to feel my body rusting more. This year has found colds and cold keeping me from swimming or walking as much as usual, so the rusty mounted. As your children age, continue to move your body. 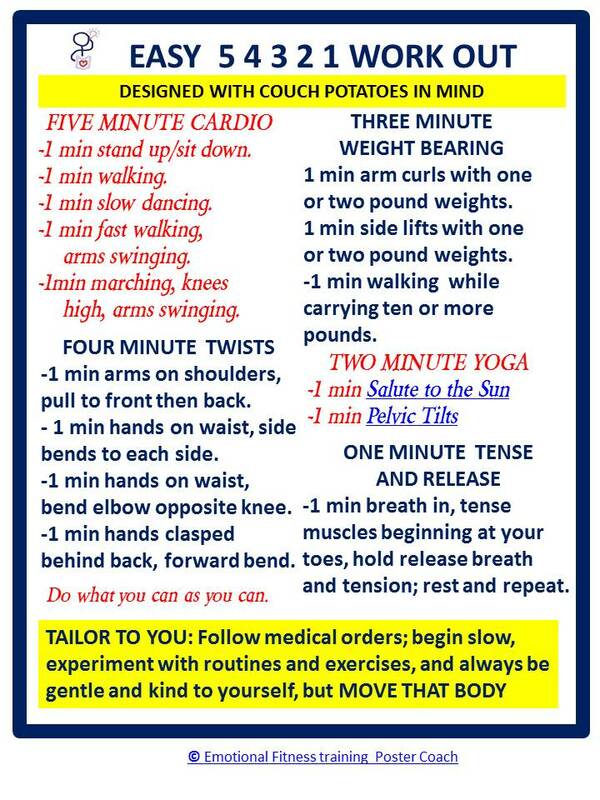 A daily, some say every other day, exercise program needs to include five minutes each of heart raising cadio, yoga type stretching, weight lifting, and weight bearing. The poster coach suggests ways to do all. Never tried yoga? The links on the poster take you to some instructional pages. Our YMCA has some great yoga classes for beginners. Take classes with your kids, even your teens if they do not object. Tai Chi and other karate type courses are useful family classes. Taking a class is a good way to motivate yourself, learn some exercise tools that you can tailor to fit you. I took aqua-size classes at our Y, but now have designed my own 30 minute workout. Layering is a two-for-one tool. How do you layer? When practicing one or another of my Twelve Daily Easy Emotional Fitness Exercises as you move your body, you are layering the two. I use walking for Being with Beauty, swimming and walking for Thinking About What Matters. Interested in learning more about Twelve Daily? Buy the book. The price is around the cost of a Starbucks latte, but longer lasting. Remember, if you liked this like, comment, share with someone who needs support while staying strong. Sharing and caring strengthens you as well as others. This entry was posted in When Good Kids Do Bad Things and tagged children, Emotional fitness, Emotional Health, emotional intelligence, Feeling management, Katherine Gordy Levine, Oprah tape, parenting, parenting tips, Parents Are People Too, physical exercise, postaday. Bookmark the permalink.